Welcome to Paris, the city of light. This exuberant city is also known as the city of love, for its romantic atmosphere. Stroll through the boulevards, passing by the bridges to the Eiffel Tower as it lights up at night. Included is a two-night stay in Paris. After breakfast transfer from Paris to Lyon by train and join your Emerald Waterways luxury river cruise ship and be welcomed by your Captain and crew. This evening, enjoy your first dinner on board with your fellow travellers. Your Cruise Director will also conduct a port talk to review the activities and itinerary for the days ahead. After breakfast disembark your river cruise ship in Arles and transfer to Marseille Airport for your onward or homebound flight. Journey to Lyon, before enjoying an authentic Provençal dinner on-board, hosted by renowned French chef, Fabien Morreale. Finish your journey with an extension in the beautiful coastal city of Nice. From Paris to Nice, discover the sensations of Southern France over 13 incredible days. 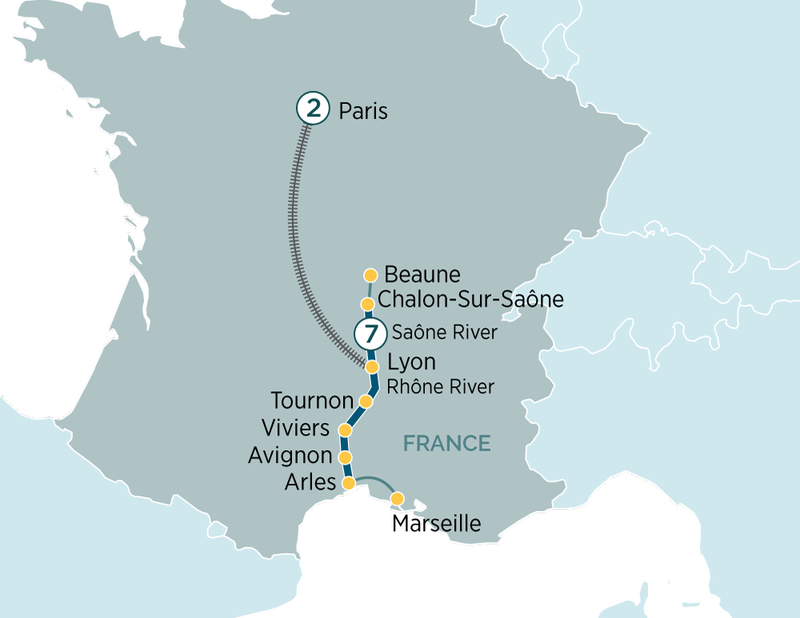 Explore Lyon, Macon, Tournon & Arles before a 3 night stay in Nice.